.... 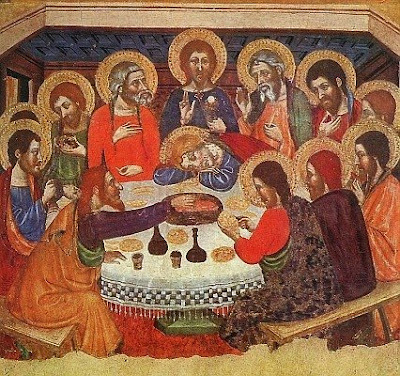 If you've never heard the term, it's not Monday-Thursday (which always confused me as a kid), but Maundy Thursday, as in Mandatum Thursday. Mandatum is the Latin word for "command" or "mandate", and the day is called Maundy Thursday because on the night before his death Jesus gave his disciples a new command. "A new commandment I give to you, that you love one another: just as I have loved you, you also are to love one another" (John 13:34). At first it seems strange that Christ would call this a new command. After all, the Old Testament instructed God's people to love their neighbors and Christ himself summarized the law as love for God and love for others. So what's new about love? What makes the command new is that because of Jesus' passion there is a new standard, a new examplar of love. "Surely He hath borne our griefs..."
"Little Friend of all the World"
"Even when He is silent"
"In sure and certain hope..."
"Even in the midnight of afflictions"
"...[N]o law...prohibiting the free exercise..."